We see the trend in 3D technology everywhere: Movie theaters, home theaters, game consoles, 3D printers. But researchers at Massachusetts Institute of Technology recently discovered that creating a 3D-inspired solar panel not only help to keep up with the trends, it could draw in 20 times more energy than flat panel designs. Traditional solar panels lay flat on a surface or rooftop, facing the sun to collect energy. 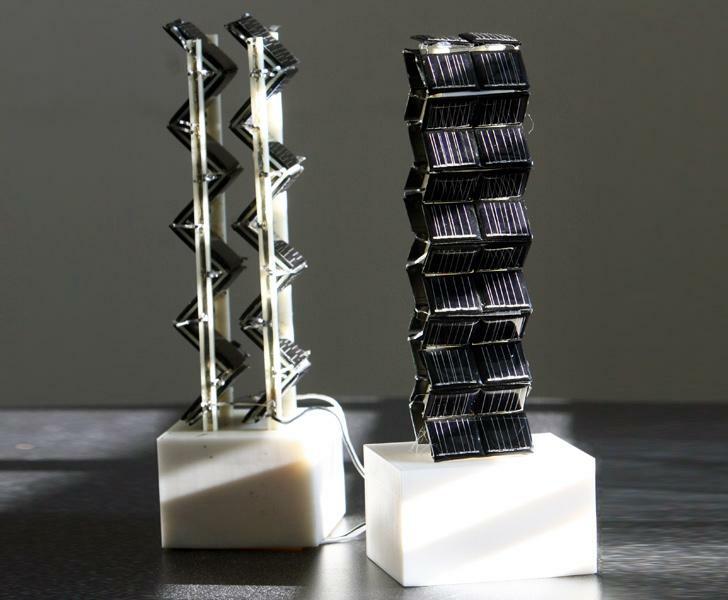 MIT researchers decided to change the shape of solar panels, conducting experiments with a cube, tall cube, and tower-shaped panels to see which design brought in more energy. Compared to flat panels, all three 3D panels created impressive results and outproduced traditional panels, with the accordion-style tower drawing in 20 times more power per square foot. The panels were tested during both cloudy and sunny conditions, and proved to perform consistently despite the weather changes. “I think this concept could become an important part of the future of photovoltaics,” said Jeffrey Grossman, the Carl Richard Soderberg Career Development Associate Professor of Power Engineering at MIT and one of the project’s leaders. The accordion-style arrays also work better because they receive solar energy from all angles rather than in just one direction. What’s more impressive is the idea stemmed out of a theory by 13-year-old Adiean Dywer who previously hypothesized that a design based on trees would produce more energy. While Dywer did not succeed in his personal experiment, this hunch proved to be useful with a more careful measurement and data calculations by the MIT team. Ah, another example of technology inspired by nature. Researchers also say the tower style panel helps save space by standing vertically, and the design will be easier to manufacture than the cubes. However, they do anticipate the designs to be more expensive to produce than flat panels, but the payoff could be worth the investment. Manufacturers aim to use thin film technologies to help reduce cost but still have the panels capable of harvesting energy in low light and cloudy conditions. The MIT study states that making these improvements can help power output become “more predictable and uniform, which could make integration with the power grid easier than with conventional systems.” With the accordion tower design, the panels could be shipped in a flat folded state, and restructured to its zig zag shape at the installation site. Researchers imagine these towers to be perfect for parking lots to help electric vehicles find their green charging stations. While researchers are confident in the tower design, they are still experimenting how to distribute the towers for the most effective use. With the height of each towers possibly shading one another from the sun, this solar array is currently designed for urban environments rather an open space. Larger scale models, however, could prove to be useful in solar farms in the near future.